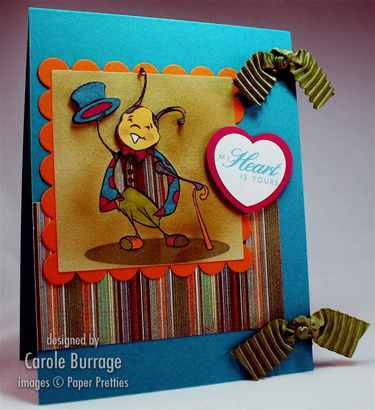 It seems only appropriate that I use the Love Bugs image in my swan song as a Guest Designer for Paper Pretties. I feel kinda like Wade E. Bug looks -- if only she lived closer, I'd love to present Christie Ortman with a fragrant bouquet and tip my hat to her as I bow out of what has been a delightful experience. Little did I know when I signed on for these three months that I'd have the opportunity to help launch her brand new stamp company -- what an exciting surprise! And I have thoroughly enjoyed getting to know the Prettie Girls and my fellow Guest Designers (Dawn Easton, Danielle Lounds, and Nancy Riley). It's been great gals! I will definitely be keeping in touch, and see you at all the Prettie parties! This card also fulfills a couple of challenges -- today's Bloggers Challenge, which has a theme of Spring Flowers (Lady Bug is holding a flower, has a flower in her hair, and the patterned paper is flowered -- surely that's flowery enough! ), and the Limited Supply Challenge for today. 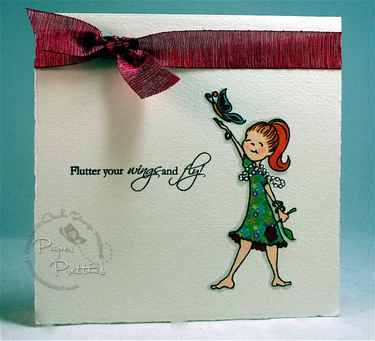 Get what Jen Javorsky came up with us for today: Use unloved embellishments in your stash on a card with flowers. Okay, I've already argued my case that this card should qualify as a card with flowers. As for the unloved embellishments? Check out those whickety wack Karen Foster Boot Loopy Brads -- what was I smoking when I bought those things?! With all the other challenges going on, I chose to forego a challenge to make a simple, one-layer black and white card. You know I hate to back down from a challenge, but that one is too cruel and unusual, even for me. Supplies Used -- Stamps: Love Bugs by Paper Pretties, sentiment from Clear Design Anytime Messages by Hero Arts; Paper: Green Galore & Bashful Blue by SU!, Georgia Pacific White, DCWV Glitter Mat Stack; Ink: Brilliance Archival Graphite Black, SU! Basic Black; Accessories: Cuttlebug, corner rounder, Copic Sketch & Spica Markers, Karen Foster Boot Loopy Brads, Dimensionals. I think I'm going to surprise a girlfriend I'd normally call by sticking this in the mail to let her know I'm thinking about her. Yeah, I know. You think I'm so sweet. Sure, keep thinking that. But actually, it's all part of a fiendishly brilliant plan: I will make this gesture of goodwill without having to come out of my hermetic existence. The ball will then be in my friend's court, and thus it will be up to her to call or email or get a hold of me somehow, which can be tough to do. Then, the next time we get together for Bunco and all of the girls start complaining about how hard I am to get a hold of, did I get the message, blah blah blah, I can look outraged and say, "What on earth are you talking about? Why, just this week I sent X a beautiful hand-crafted card made with LOVE!" It takes too long to explain; people just don't get what I mean when I say I'm feeling hermetic right now because, usually, I come across as kind of an extrovert. I'm really both, and my DH would be the first to tell you: I'm an extroverted hermit. Actually, he'd probably just say I'm "moody." This card was made with Paper Pretties' adorable "Look Who's Perky!" set, which I just love. And see the sage coloring on the cups? I don't have a Copic to match Sage Shadow, so I finally tried my pal Jody's Drunken Watercolor technique by filling an AquaPen with alcohol, getting a little sage ink on the lid of my inkpad, and coloring away. It worked perfectly! 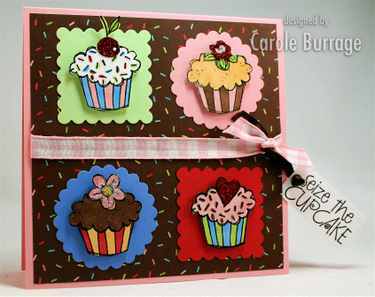 Supplies Used -- Stamps: Look Who's Perky by Paper Pretties; Paper: Sage Shadow, Very Vanilla & Chocolate Chip by SU! ; patterned paper from a $1.00 pack at JoAnn's; Ink: Brilliance Archival Graphite Black, Sage Shadow; Accessories: Nestabilities; AquaPainter, rubbing alcohol, Copic Sketch markers, oyster ultrafine Art Glitter; ribbon. I finally got a big ol' batch of new rubbah from Stamping Bella mounted and ready to play with (and I only stabbed myself once with the hot knife in the process... I love my hot knife, but I'm not sure someone as absentminded as I am should be allowed to have one. I have a tendency to forget that it's a. )hot and b.)sharp...) Anyway, lookie what I made for today's Bloggers Challenge (to make a birthday card)! Supplies used -- Stamps: Best Friends Forevah by Stamping Bella, Sassy Circles by Paper Pretties, sentiment by The Cat's Pajamas; Paper: Kraft and Purely Pomegranate by SU! Georgia Pacific White; Ink: Brilliance Archival Graphite Black, Pink Passion by SU! ; Accessories: Nestabilities, Copic Sketch and Spica markers, Swarovski crystal, paper piercer, white pen, foam mounting tape, Crop-a-Dile, SU! ribbon. 1. DH says something dumb and/or insensitive. 2. The injured party (me) responds with totally appropriate outrage and expresses this with every verbal weapon in her arsenal. She has a large vocabulary, so this step can take a while. 3. DH asks if it's "that time of the month." 5. The injured party gets distracted by something else, forgets that she's mad and says "Hey, did you see this?" in reference to whatever distracted her. 6. DH and the injured party kiss and make-up (even though the injured party is sure the entire incident is 100% DH's fault). The above scenario just happened to coincide within moments of the start of SIYJ. And naturally, once these things get started, it's hard to say "Hold that thought -- I'm expected at an online stamping party right now!" So I owe Christie Ortman, the Prettie Girls, my fellow Prettie Guest Designers, and the party people my sincere apologies. I'm sorry, girls! I'll do better next time. Supplies used -- Stamps: Flutter By by Paper Pretties; Paper: Fabriano Medioevalis square notecard, Berry Sweet 8"x8" designer paper pad by K & Co. (for paper pieced dress); Ink: Brilliance Archival Graphite Black; Accessories: Copic Sketch Markers, white pen, gold metallic Sharpie, ribbon. 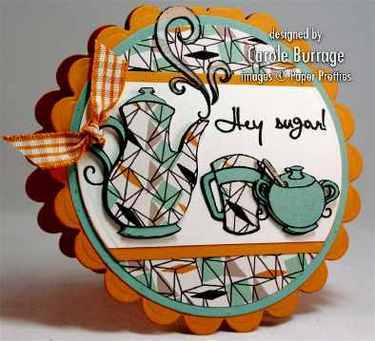 Pour Some Sugar on Bloggers Challenge # 37! 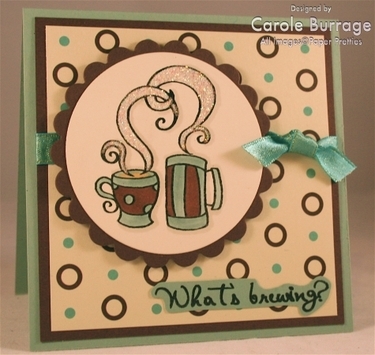 This week's Bloggers Challenge was to make a card in anything but a rectangle shape. I had already experimented with Michelle Wooderson's fantastic idea to use Nestabilities to make cards earlier in the week with the oval shaped hostess cards for the MFT release, but I knew for this challenge, I wanted to play with her signature clamshell card made with the largest sized Nestie scalloped circle. Supplies used -- Stamps: Look Who's Perky by Paper Pretties; Paper: More Mustard, Shimmery White, Moss Green Glitter cardstock by The Robin's Nest, patterned paper by Foof-a-La, vellum; Ink: Palette Hybrid Noir Black; Accessories: Nestabilities, ribbon, silver glitter pen, Dimensionals. I've got several yummy things to share with you, two of which involve cupcakes! Who doesn't love cupcakes?! If you raised your hand, well, then I don't think I want to know you. 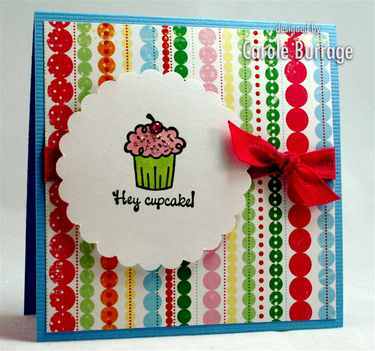 This first card was made with Jen's weekly Sketch For You To Try -- it's perfect to use with sets that have several of images of the same size, like Hero Arts' Clear Cupcakes. Be sure to visit Shannan, Susan, our new SFYTT pal Amy Sheffer, and Jen's Guest Designer for March, Joanne Basile, to see how they've interpreted this sketch. And, if you want to play along with us -- of course you do! -- please use the keyword 'SFYTT' when you upload to your SCS gallery so we can check it out! Next is a simple little card I've prepared for Simply Scrapbooks, my LSS. Terri -- the fabulous owner -- has just started selling stamps from some awesome companies like My Favorite Things, A Muse, Pink Paisley, and Lizzie Anne Designs. (I'm sure The Cat's Pajamas won't be far behind... : ) ) And, guess what else she'll soon be selling?! COPICS and NESTABILITIES!! That's right -- right here in Claremore, America! Dreams really do come true! Anyway, I've promised Terri that if she would start selling stamps and stamping supplies, I would help her launch that part of her business. So next Thursday, anyone who stops by Simply Scrapbooks between 3 - 7 p.m. can make this quick and cute little card with the help of yours truly for absolutely free. What a bargain! And, last but not least, here's another simple but sweet something starring Sophia from Paper Pretties (which happens to be having an awesome sale right now AND has all of American Crafts yummy Easter ribbon). I just love the way using a Fabriano Mediovalis notecard instantly elevates the elegance of a one-layer card. If you haven't tried Fabrianos yet, you must must must. Seriously. Head on over to Starlit Studios eBay store and order some. Trust me -- you need these. Seize the Cupcake -- Stamps: Clear Design Cupcakes by Hero Arts; Paper: Pretty in Pink, Green Galore, Ballet Blue, Real Red, Georgia Pacific White, patterned paper by Marcella; Ink: Brilliance Archival Graphite Black; Accessories: ribbon, Copic Sketch markers, Art Glitter, Nestabilities, Dimensionals. Hey Cupcake! -- Stamps: frosted cupcake by A Muse; Paper: Bazill cardstock, patterned paper by Adornit by Carolee; Ink: Brilliance Archival Graphite Black; Accessories: Marvy Uchida Mega scallop circle punch, Copic Sketch markers, A Muse Creative Candy; ribbon, Stickles. Sophia Hugs: Stamps: Need a Cuddle and Sealed With a Kiss (sentiment) by Paper Pretties; Paper: Fabriano Mediovalis notecards, patterned paper for dress from Baby Boy Stack by DCWV; Ink: Briliance Archival Graphite Black; Accessories: Copic Sketch Markers, Ribbon. Three-Fer and Howdy from CHA! This lil guy is named Wade E. Bug (get it?! hee) and he's one of the latest images from Paper Pretties. Isn't he dapper? He's dressed in the latest colors from this week's Bloggers Challenge (to use teal, pumpkin pie, rose red, and old olive), and his sketch is this week's Sketch For You to Try by my roomie, Jen del Muro. Be sure to take a look at what Shannan (who gets here tonight) and Susan do with this ultra-versatile design. I'm going to make every effort to post later about all the fun we're having and what we're seeing, but I want to start you off easy. Baby steps, you know? I don't want you to get dizzy or nauseated by all the fabulousness or hate me even more than you do because of the whole washer and dryer envy. It's been roughly a week since I last posted, and I mean 'roughly a week' in every sense of the phrase. Immediately upon posting last Friday's Bloggers Challenge, I succumbed to whatever nasty bug had been devouring every other member of my family. The big difference between my 'bout with the aches, chills, hacking cough, and fatigue? No mama around to care for the Mama. I'm sure most of you are too familiar with that particular phenomenon. So sickness completely killed last weekend. I awoke early on Monday, determined to make good use of the day. Which meant rising and shining to showering, cleaning up a bit, etc. I told myself that getting a good start on what needed to be done around the homestead and delaying my stamping gratification until after I'd completed a few necessary chores would not only be prudent, but give me an enhanced feeling of self-worth which could only do wonders for my art. I would be able to stamp without that nagging voice in the back of my head saying, "You really should do a load of laundry..." So stamping was put on hold until the afternoon, when I would finish up (or start) a couple of projects to share with the gals at Monday evening's Paper Pretties new release party. Sounds good, right? Wrong. Long story short, I ended up needing to take my mother to the emergency room that afternoon. After not being able to get a hold of her by phone or knocking on her door, I found the key to her house and entered to discover her somewhat disoriented and just not... right. Eventually that evening, she was admitted, with her doctor guessing that she must have had a stroke. It was terribly sad, and though we've had a few ER trips and hospital stays over the last months and years, for the first time I truly felt as if there wasn't a whole lot left of the woman who raised me in the shell of the person who lay in that hospital bed. With my mom under observation and Sean able to handle whatever might come up, Carter and I left at 6 a.m. on Tuesday morning for Kansas City to an appointment with his pediatric orthopaedist. While there, Dr. Gupta determined he could get Carter in for Botox treatments* the following afternoon if we could stick around. Well, the timing was horrible with Mom in the hospital, but there wasn't much I'd personally be able to do for her, and this would save Carter and I another 8-ish hour round trip, plus get Carter the treatment that he needed sooner than later. So, we bought a few toiletries, toys, and clothes at Target, got hit with a weird little snowstorm, stopped by the very awesome Stamper's Ink, and hung out until his 2:15 appointment on Wednesday. Right after Carter went under the anesthesia, I realized I had not brought in a fresh diaper for him. Then I realized I had locked my keys in my car. I kid you not. Thank the good Lord for AAA... We finally made it home Wednesday evening right as the American Idol theme music began. Yesterday morning, I went to see my mom and was so relieved to find her more or less back to normal. She's a little weak, but very lucid. As I said, I really didn't expect to ever see 'the real her' again. It's no secret that my mom drives me batsh*t crazy, but she's my mom and I love her, you know? I'm very, very grateful to have her back. She'll be discharged later today. We're in a rotten cycle that is inching it's way towards Mom not being able to live independently, but for now at least it's not as bad as it could be. In the meantime, here's something I made for the Paper Pretties party I wasn't able to attend. Luke and Lexi were colored with Copic Sketch Markers, then cut out and popped up with Dimensionals. Their backdrop is a layer of Cuttlebugged Regal Rose on top of faux-stitched Kraft. Around the layer of patterned paper is a border of scallops doodled with a white-pen. And that lovely, shimmery bow is from one of my dear buddy Jody's fantastic ribbon shares. (I think she's having a Prima flower share going on right now; if you've never done one of Jody's shares I'm not sure you can really consider yourself a papercrafter. They're kind of a right of passage, you know). 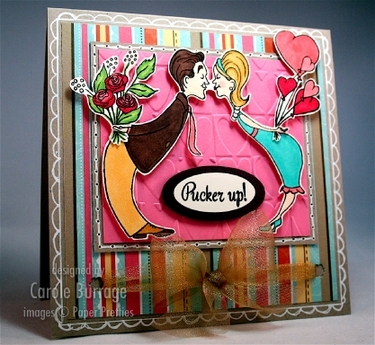 Supplies used -- Stamps: Sealed with a Kiss by Paper Pretties; Paper: Kraft, Regal Rose, Very Vanilla, Chocolate Chip, patterned paper by unknown source; Ink: ? (the images were actually stamped off for me by Prettie Girl Joanne Basile because I haven't received my set yet; thanks, Joanne! ); Accessories: Copic Sketch Markers, Cuttlebug and heart embossing folder, flower punch, ribbon, oval punches, paper piercer, white pen. Now, you know I love my good friend, Oprah, but I have to say, I think this Sophia is far cuter, cuddling her sweet teddy-bear, with her hair combed back and fastened with a fancy bow. 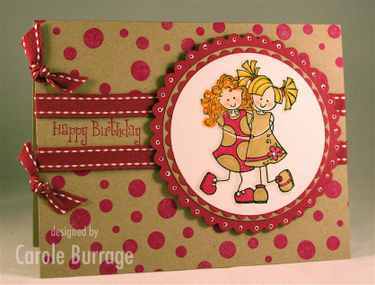 The inspiration for the details and layout for my card came from this fresh and fun card by today's Featured Stamper, KathyC. I flipped the layout on its side, changed the color scheme, and added a border of around the central panel. Sophia was colored with Copic Sketch markers, and her dress is by Daisy D's via paper piercing. I got up the nerve to cut into the Nestabilities embossing pads I got for Christmas and embossed the image layer oval; it adds a little fanciness to match Sophia's fancy bow. Supplies used -- Stamps: Need a Cuddle? by Paper Pretties; Paper: Very Vanilla, Bordering Blue, Brocade Blue, Ruby Red, patterned paper by Daisy D's; Ink: Brilliance Archival Graphite Black, Ruby Red; Accessories: Cuttlebug, Nestabilities, Copic Sketch Markers, Dimensionals. Is she not just the most adorable little gal you've ever seen etched in polymer?! I love her from the tip of the pom pom on her fleecey hat to the soles of her polka dot boots! And that look of pure joy on her face -- don't you remember feeling like that on those most magical of days: snow days! I grew up in Alexandria, Virginia. We'd usually get one or two good snows a year, and I can recall waiting anxiously by the TV set, hoping to see or hear "Fairfax County Schools" as the list of school closings was announced. And when it was? What a windfall of good fortune! I don't think winning the lottery today could feel any better. I used Jen del Muro's Sketch For You To Try to pose Sophia, and she was fleshed out with Copic Sketch Markers. Her boots and the cuffs of her jacket are fleeced with Liquid Applique, and her snow angel is highlighted in Stickles. The edges of her panel was frosted by laying a thin line of glue and then dipping each edge in Diamond Dust. Be sure to visit Shannan Teubner and Susan Liles to see their interpretation of Jen's sketch. And, if you use this sketch and upload it to your SCS gallery, please use SFYTT as one of your keywords so we can be sure to see it. Until now, Paper Pretties has specialized in subscription card kits that feature stamps from My Favorite Things, Stamping Bella, and Rubber Romance. But the new year has brought lots of changes to Paper Pretties; owner Christie Ortman and her design team, the Prettie Girls, have been working feverishly to launch a new and improved website complete with reader galleries, forums, and a Boutique featuring all of your favorite paper crafting products. I predict you're going to be seeing a lot of Sophia, Snowflake the Penguin, and Paper Pretties in general in 2008! You might as well just go there now and get it over with -- you KNOW you'll be enabled, so why prolong the inevitable?! And while you're there, be sure to stop by the Guest Room and visit me along with my fellow guest designers Nancy Riley, Dawn Easton, and Danielle Lounds. Supplies used -- Stamps: Snowflake Kisses set by Paper Pretties; Paper: Regal Rose, Whisper White, sparkley cardstock by Doodlebug Designs, patterned paper by Paper Salon; Ink: Staz On Black; Accessories: Copic Sketch and Spica Markers, Stickles, Diamond Dust, Liquid Applique, Dimensionals, Ribbon. PS -- I won't be drawing the winner of the Blog Bon-Bons until later tonight, so if you haven't entered yet, you still have time! I mean, come on: let's be honest. I'm no natural beauty. I'm not fishing for compliments; I'm just stating a fact. As a girl who went through a PAINFULLY awkward adolescence (think glasses, braces, and a terrible perm that took two years to grow out), I knew I had to hone other parts of my being if I wanted to be considered attractive to other members of the human race. There are a lot worse things than being average looking; artfully applied make-up, decent clothes, and a sense of humor can do wonders for the most ordinary duckling. I may not be a swan, but surely I could be considered a DILF. So it's with great satisfaction that I share with you a brand new development. While I'm not considered OFFICIALLY PRETTIE (the story of my life... *sigh*), I am the next best thing! For the next three months, I will be serving as a guest designer for Paper Pretties!!! And let me tell you, this is an especially exciting time to be getting involved with Christie and the Prettie Girls (the too-cute moniker of Paper Pretties oh-so-talented Design Team members). Paper Pretties has a big surprise coming right around the corner that I guarantee will make you SWOON! I'll have more details about that next week. In the meantime, Paper Pretties is starting a sale tonight at midnight, and ALL regularly priced merchandise in the Paper Pretties Boutique is going to be on sale for 25% off through January 10th! New merchandise will be added to the store daily, so keep checking in because you never know what will show up that you're going to NEED! The Paper Pretties website has had a fabulous new makeover, as well, and is now sporting my all-time favorite color: sea-foam green! A huge sale, my favorite color, and thrilling new developments occurring at the exact moment in time I become involved with Paper Pretties? Some might call that a coincidence, but like my buddy Oprah, I don't really believe in coincidences. It's fate, I tell you, FATE! I can almost hear the Universe whispering in my ear "You've passed the test, grasshopper; it may take a while for some mortals to understand, but in the meantime, know that you're PRETTIE on the inside!!!"